Most of the bunk rooms that I post are modern in nature. Well this one is unusual because it definitely has more of an elegant and romantic vintage feminine look. Don't you just love the privacy curtains? 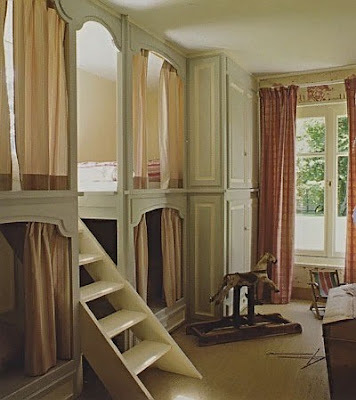 What a great looking room - love the vintage bunks. How beautiful! The design reminds me of the puppet show scene from The Sound of Music. Doesn't get any more traditionally vintage than that!